After last weeks introduction into Austrian Soups I want to dedicate this weeks Cuisine article to what I call the Big Four: Wiener Schnitzel, Tafelspitz, Schweinsbraten and Gulasch. You can find this four main courses on almost every menu of an Austrian Restaurant and they are delicious. Sad news for Vegetarians – all of them are based on some kind of meat. This dish is made out of veal, thinned and then coated in bread crumbs and fried – Traditionally you have potato salad with it. If prepared well it should have an almost golden colour when served and you will love it. 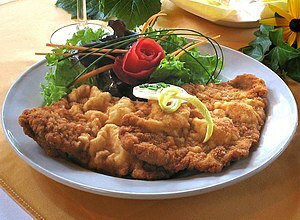 As veal is rather expensive, you will also find Wiener Schnitzel vom Schwein on many menus. This is more or less the same thing, but made out of pork. A lot of restaurants who over this variant serve it with Pommes Frites, as this is how people love to have their Schnitzel nowadays. I strongly recommend everyone to try this, when visiting Austria! Tafelspitz is one of the finest dishes you can find in Austrias traditional cuisine. This is a piece of a young ox – from the bottom sirloin primal cut (tri-tip in the United States). The beef is simmered with root vegetables and some spices in a broth. Afterwards it is served accompanied by roasted slices of potatos and horse radish. I usually add some spinach additionally and you can see this a lot of times in restaurants, too. This was emperor Franz Josef´s favorite dish and is a culinary highlight which should not be missed! This is a dish, which you will also find in Germany, especially in Bavaria. The Austrian rural dishes are often quite similar to Bavarian dishes and this is a prime example of a shared food experience. Schweinsbraten is roast pork. 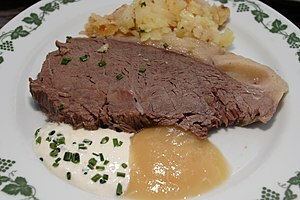 It is normally served with Semmelknödeln (dumplings made out of bread) and Krautsalat (cabbage salad), but you might also find it with potatoes, and sometimes instead of the cabbage salad you get Sauerkraut (sour cabbage). I personally prefer it with dumplings. This is a great meal if you visit rural parts of Austria. 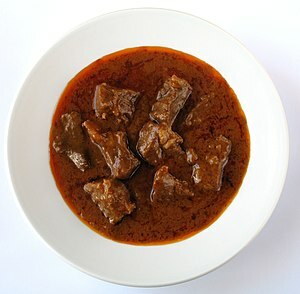 Gulasch (Goulash) is a great example of the influence of the history of the Habsburg Empire to Austrian Cuisine, as this dish originates in Hungary. But be aware, if you order Gyulas in Hungary you will get something rather different, than in Austria. Austrian Gulasch can be compared to Hungarian Pörkölt – it is a thick stew made out of beef with a lot of onions. There are no tomatoes or other vegetables in it, which are a important part of hungarian Pörkölt. 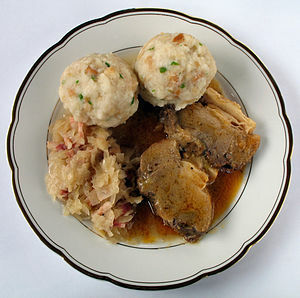 Gulasch is normally served with Semmelknödel (Dumplings made out of bread). Very typical for Vienna is a variation of this – the so called Fiaker Gulasch. Fiaker are the horse drawn buggies, which you can see all over Vienna and it is also the name for the person who drives it. A Fiaker-Gulasch has additionally to the traditionally Gulasch some fried egg and fried sausage added. All forms of Gulasch go well with a pint of Austrian beer. If you ever visit Austria you should definitely try the Big Four – this dishes are the core of Austrian Cuisine. Next week I will try to give you some alternatives for Vegetarians. Thanks so much, Gernot! I have been to Austria once, about 6 years ago. I was in a small town not far from Vienna, beautiful, but can’t remember the name! It was only a long weekend, passing through to visit friends on the end of a business trip. We went to a local restaurant the last day I was there and had the most incredible ham and sauerkraut dish, with potatoes. I don’t remember the name but it was wonderful! Thanks for offering to feature it – if you can find it I will be very happy :). I think I know what you had … I will Write something about it, but it might take some time, as it does not really fit into the planned topics of the next weeks.